Life doesn't begin the way we thought it did. 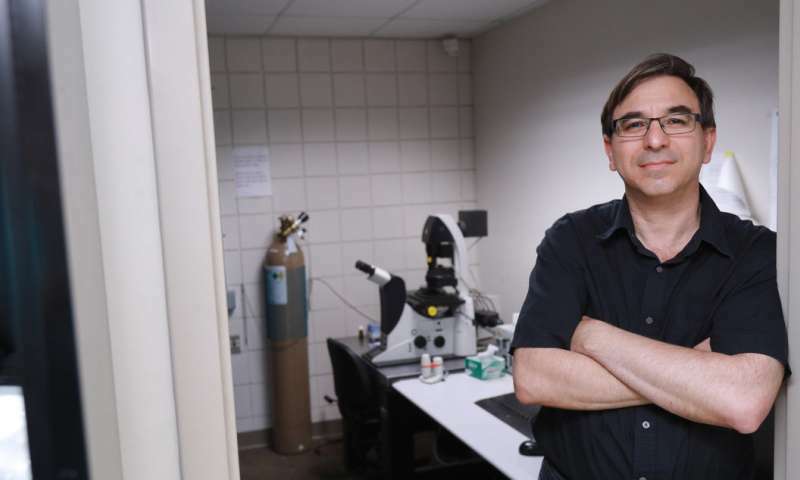 A new study at The University of Toledo shows that a father donates not one, but two centrioles through the sperm during fertilization, and the newly discovered sperm structure may contribute to infertility, miscarriages and birth defects. The newly discovered centriole functions similarly and along with the known centriole. However, it is structured differently. "This research is significant because abnormalities in the formation and function of the atypical centriole may be the root of infertility of unknown cause in couples who have no treatment options available to them," said Dr. Tomer Avidor-Reiss, professor in the UT Department of Biological Sciences. "It also may have a role in early pregnancy loss and embryo development defects." The centriole is the only essential cellular structure contributed solely by the father. It is the origin of all of the centrioles in the trillions of cells that make up the adult human body. Centrioles are essential for building the cell's antennae, known as cilia, and cytoskeleton, as well as completing accurate cell division. A zygote, or fertilized egg cell, needs two centrioles to start life. It was previously thought that sperm provides a single centriole to the egg and then duplicates itself. "Since the mother's egg does not provide centrioles, and the father's sperm possesses only one recognizable centriole, we wanted to know where the second centriole in zygotes comes from," Avidor-Reiss said. "We found the previously elusive centriole using cutting-edge techniques and microscopes. It was overlooked in the past because it's completely different from the known centriole in terms of structure and protein composition." The atypical centriole contains a small core set of proteins needed for the known sperm centriole to form a fully functional centriole after fertilization in the zygote using the egg's proteins. This discovery may provide new avenues for diagnostics and therapeutic strategies for male infertility and insights into early embryo developmental defects, according to the research titled "A Novel Atypical Sperm Centriole is Functional During Human Fertilization" that was published today in Nature Communications. In addition to human sperm, Avidor-Reiss and his research team studied the sperm of flies, beetles and cattle. "The whole idea for this study started with the fly," said Lilli Fishman, UT Ph.D. candidate who is being honored with the 2018 Lalor Foundation Merit Award from the Society for the Study of Reproduction for her work on the project. "Basic fly research indicated the misconception in sperm structure. It has been incredible to be part of the ensuing process that included incredible scientists from four states and two countries." The cutting-edge techniques and microscopes used on this research include super-resolution microscopy; electron microscopy with high-pressure freezing; and correlative light and electron microscopy. "The super-resolution microscopy was critical for this discovery," Avidor-Reiss said. "The technology allows you to see proteins at the highest resolution." The University of Toronto, National Cancer Institute, University of Michigan, and University of Pittsburgh also contributed to the research. Avidor-Reiss and his team are taking this research to the clinical level. 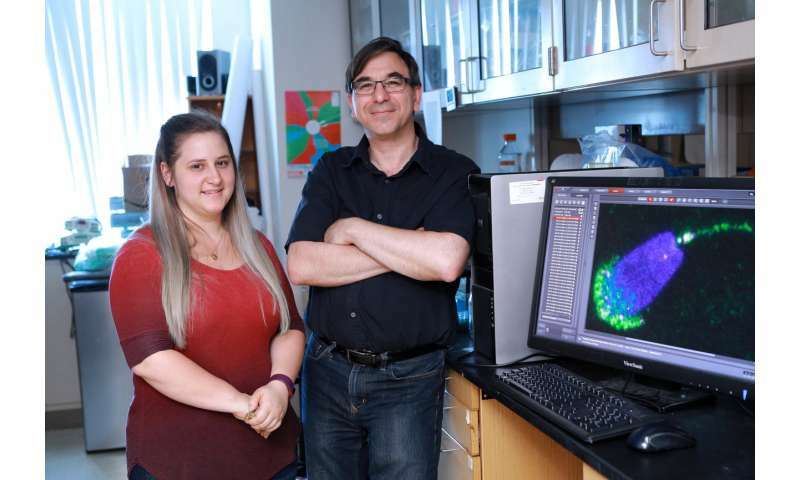 "We are working with the Urology Department at The University of Toledo Medical Center to study the clinical implications of the atypical centriole to figure out if it's associated with infertility and what kind of infertility," Avidor-Reiss said.